An immobiliser is an anti theft device which makes it difficult for a would be car thief to steal your car. In simple terms the device will either prohibit the starter motor from working, so when you turn the key to crank nothing happens, or, cut the fuel to the cars engine, the car will crank over but not start. There are variations in different makes of car and some cars immobiliser systems incorporate both a starter inhibitor and a fuel cut off system. The simple answer is yes, if your car was made after 1995 it will have an immobiliser. In the UK around this time all car manufacturers fitted an immobiliser system to their vehicles. How does an immobiliser work? Initially the immobiliser systems were quite basic, it would consist of a transponder key (key with a chip inside that has an identification) or a remote fob, an immobiliser box (a basic electronic control unit) and finally a mechanical means of immobilisation (a fuel cut off switch or starter inhibitor). As time has progressed vehicle immobiliser systems have become more sophisticated, although the basic principal is the same the way it is implemented on the vehicle is different. The reason for this is as cars have evolved they have become more and more electronically controlled (the ecus or black boxes/ computers). 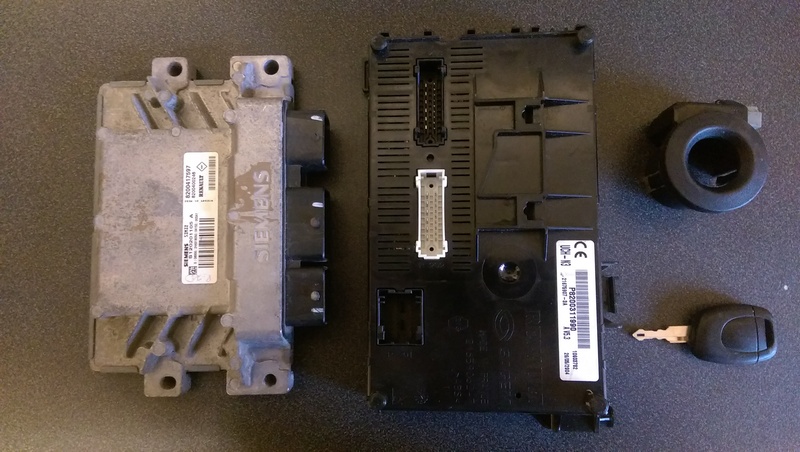 A Renault engine control unit, body control module, key reader and key. This means that the way the car communicates is now digital, most modern cars cars will have at least 10 computers, and some will have up to 30 or 40 control units. The control unit that contains the immobiliser and the way it communicates will vary from car to car, however the principles of the immobiliser function will be the same. The system will have a transponder key with a unique identification,this is programmed to the immobiliser control unit, there will also be a transponder key reader and a final output ,the engine control unit. Each computer will communicate digitally and the system is programmed by a specialist diagnostic computer. On the whole immobiliser technology has substantially reduced vehicle theft and virtually wiped out opportunist car theft, so immobilisers are good, but the increased technology used means the immobiliser system can malfunction and in turn this means you need an expert to diagnose the problem and fix it. Replacement car keys are specialists in car immobiliser systems if you have an immobiliser problem call us 07857 086142.